Last Friday, we had another game of our Epic Moderns game, rather than using the freshly completed British, I was running a US force. At 1730 Zulu time, lead elements of the US 2nd Armoured Cavalry Regiment along with elemnts of an Israeli Reserve tank company. The units were engaged by a numerically superior mechanised force, identified as being Iraqi and Syrian origin. Ghost Company of the 2nd ACR deployed within Al Tanf itself, with elements of the 82nd Airborne deployed defending the nearby airfield. In supporting positions were the Israeli armoured units, which were deployed in covering positions behind berms. 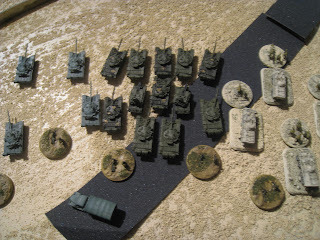 Ghost Company immediatly surged out of the town, using their superior mobility and fire control systems on the Abrams tank to engage the command T-72 company, causing the lead 3 tanks from the company. Further supporting fire from the Bradley's TOW missiles caused further casualties. The first of the Israeli Tank companies attempted to surge forward and fire, but were to slow to prepare their tanks, and were unable to fire before the enemy T-72s engaged them, causing damage. The M551A1 Sheridans from the 82nd Airborne used their Shillelagh missiles against the already damaged T-72 company, causing two further destroyed T-72s and breaking the company. Unfortunatly for the M551s, in their hunt for missile kills they lingered too long in one place, and were engaged by enemy tanks, destroying all three lightly armoured vehicles. Word of the onrushing Syrian and Iraqi armour had reached higher command, and it was time for the Israeli Airforce to show it's might. The Air support rolled in onto the enemy mechanised company, causing multiple destroyed transports and infantry. 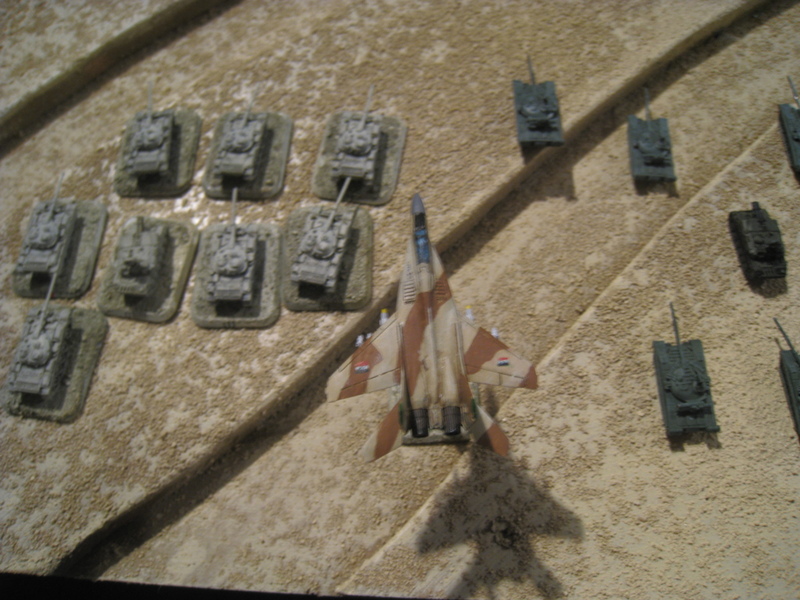 The Syrian and Iraqi ground forces were well equipped with Air cover, three MiG-29s rolled in onto the Cobras and F-16s destroying all of the Israeli air support with Alamo Anti-Aircraft Missiles. The airfield guarded by an understrength company of the 82nd Airborne, deployed in the nearby wadi. Two companies of Iraqi T-55 crossed a nearby berm, engaging the infantry with both cannon and machinegun fire. The 82nd returned fire with the few Dragon ATGMs they had, destroying few of the enemy vehicles. The Israeli reseve tank company equipped with uparmoured and upgunned M60 tanks engaged the lead T-55 vehicles, causing damage to the first of the enemy tank companies, breaking the company. It was now that the F-14s scrambled from the USS Roosevelt from the Jolly Rogers squadron arrived on station, using their 20mm cannon against T-55 tanks. This marked the return of the Syrian MiG-29 flight, who shot down one of the Tomcats. The second Tomcat dispatched the first MiG through a Sparrow missile shot, before closing in and destroying the second by closing and firing with the 20mm cannon. A third MiG, this time of Iraqi origon dropped out of the high cloud, seeking to strafe the Israeli tanks. The F-14 had remained on station after intercepting the other two MiGs, rolling in after the final MiG, dispatching it with a Sparrow missile. Ghost Company 2ACR further engaged the lead T-72 company, destroying it outright with fire from the M1 Abrams and M3 Bradleys. Return fire began hitting the buildings around Ghost company, accurate artillery fire and direct fire from the undamaged T-72 company. 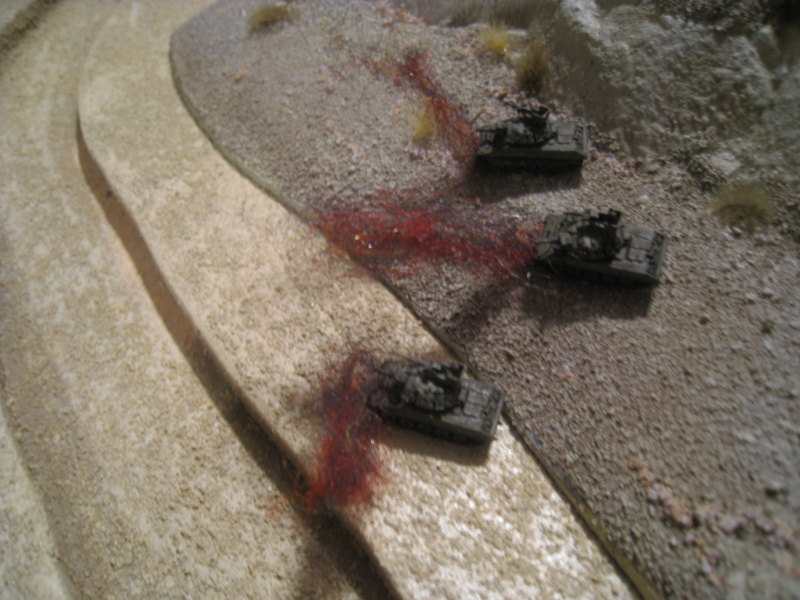 Three Abrams suffered damage to their tracks and running gear, causing them to become immobile. Ghost was forced to destroy them with the 120mm cannon on the remaining Abrams, before withdrawing from Al Tanf. 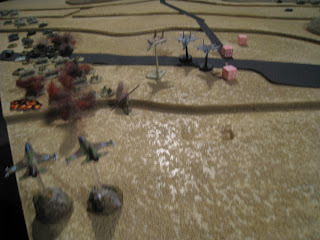 Meanwhile, the 82nd were being hard pressed by the Iraqi armour, who were seeking to assault through the 82nds position. Between LAW and Dragon anti tank missiles, the 82nd were able to inflict severe casualties onto the assaulting armour, before falling back first over the airfield, before making a fighting withdrawl into the nearby high ground. The remaining Israeli armour was by this time fighting valiantly for survival. Despite casualties, the Israelis pushed forward, causing casualties on the Iraqi armour, covering the 82nd's withdrawl. The defense of Al Tanf had given the coalition forces valuable time to establish a defensive line further south, but left the town of Al Tanf in the hands of the combined Syrian/Iraqi army.